When your pickup truck came off the assembly line, the bed was an uncovered opening exposed to the elements and to any wandering hands that may seek to grab your personal items. While driving a pickup truck without a bed cover, winds swirl through the bed, blowing any light materials and causing drag that affects your fuel mileage. 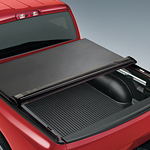 The answer to these issues is the tonneau cover. There are many forms of tonneau covers. The most effective create a flat surface over your truck bed that secures any personal items you may keep there. The cover also slips winds across the top reducing the drag effect and boosting your fuel mileage. Some tonneau covers require you to drill holes in the sides of your bed to hold the cover in place. At Bowman Auto Center, we can help you find a like-new truck or SUV to haul your gear.